Notre Dame currently on fire. What a shame—heard it on my car radio a little while ago. [QUOTE=Mr. Kotter;14207528]Why good-golly if we could get 50-60 of those things working on this....they'd be dumping a whole 928 gallons of water every couple of minutes or so, as long as they could organize and coordinate that Congo-line of "Flying Water Tankers!" God you are an idiot. They hold 50,000 to 60,000 gallons. Someone wanted to know how fast they filled and that is from the builders spec sheet. That doesn't mean that they only hold 3,000 liters. It means that it takes a bout 15 seconds to fill that much. You don't have the slightest idea what you are talking about. But I get it. That won't stop you. Because...….Orange Man Bad. There is no other way. Everyone at Fox to claim it is Fox? He has plenty of critics at Fox ya' know. That reminds me of the time MSNBC criticized Obama. Bwahhahahaha! Just kidding that never happened. So Notre Dame is on fire after an attack and the response from many of you is "Let's use this to make fun of Trump!" That's really the entire focus of your existence isn't it? So Notre Dame is on fire after an attack and the response from many of you is "Let's use this to make fun of Trump!" The attack mentioned in the O.P. is from 2017. Someone necro'd an old thread and put the fire story from today into that, and that's led to some confusion. Why good-golly if we could get 50-60 of those things working on this....they'd be dumping a whole 928 gallons of water every couple of minutes or so, as long as they could organize and coordinate that Congo-line of "Flying Water Tankers!" 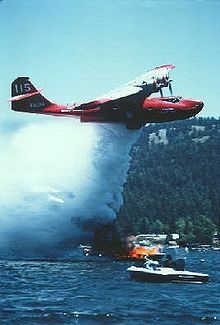 Yes, well, what does that have to do with flying water tankers? They aren't used on urban fires. I doubt France even has one. Why would you think France doesn't have an air tanker? To seconds on google shows they have at least a half dozen with 2600 gallon capacity and regularly send them out to help other countries. Is there really an American who doesn't know this is a real thing? Other than the press, I mean. TDSers gonna' TDS. Let them rage and froth with no factual basis, it's fun to watch. Hey Sybil, shouldn't you be teaching your students about how Marx crossed the Delaware instead of dicking around on the interwebs?